These products are Manufactured by cold drawing of seamless and welded fully killed steel tubes.This Particular process assures a high dimensionals precision,while different kind of following heat treatments are used to reach different levels in mechanical properties. WELDED SMOOTH BORE CYLINDER TUBES INSIDE H9 OR H10. 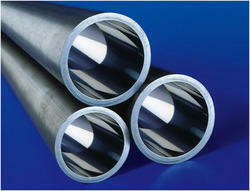 COLD DRAWN SEAMLESS TUBES FOR HYDRAULIC AND PNEUMATIC POWER SYSTEMS. No heat treatment after final cold drawing. After the final cold drawing process,tubes are stress relieved in controlled atomosphere in order to reduce work hardening due to the cold forming process. After final cold drawing process,tubes are annealed in controlled atomosphere. After final cold drawing process,tubes are normalized in controlled atomosphere at a temperature exceeding the austeniting temperature. Our standard stock includes cold drawn tubes, both SEAMLESS and WELDED, with machined ID according to tolerance H8 EN 20286 and roughness (Ra) below 0.4 micron (µm). Chemical and mechanical features are the same of the raw tube (see steels-table for cold drawn tubes suitable for honing), which is machined on ID. The dimensional tolerances are the same of the raw tube, except for the ID, which is according to H8. Itis used for cylinders on self-propelled cranes, hydraulic systems for lifts, tipping pistons and telescopic cylinders for automotive and hydraulic platforms. They can replace solid piston rods for pneumatic cylinders in order to reduce mass forces in high speed pistons. ID: standard stock material is according to EN 10305-1. 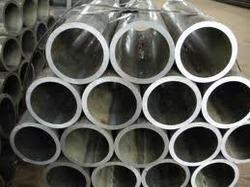 In case of tubes suitable for telescopic cylinders, that can be supplied on request, the tolerance allowing the machining also on the ID has to be agreed at the time of the order. The manufacturing process and strict tests foreseen for the cold drawn SEAMLESS and WELDED tubes give as result a fine grain steel with high pureness degree together with a high dimensional precision. These tubes are intended to resist to internal pressure and are therefore used for the manufacture of cylinders. They are produced in all the sizes used for hydraulic and pneumatic applications, in different steelgrades and delivery conditions. O.D. : see dimensional table for tubes suitable for honing. L= total lenght of the tube, max. values to be checked on the total tube length.